The author of 100 Promises to My Baby explores 100 questions children ask, sometimes whimsical, often mystical, and shares some insights on how to foster a child’s imagination, creativity, and sense of self. “As a mom, I realized early on that my children were looking to me for answers,” Mallika Chopra writes. “Even before they could speak, they were asking questions, questions about how to interact with the world. 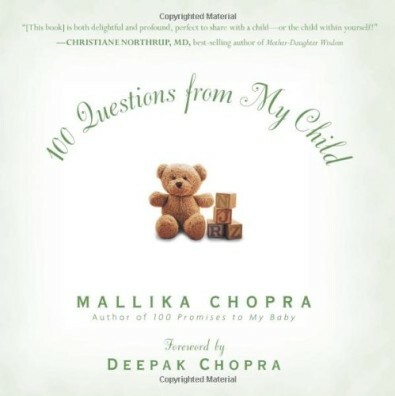 And it was my reaction to these questions that began to shape their worldview, their sense of security and trust.” Embracing the responsibilities of parenthood as a sacred trust, Mallika shares with other moms and dads her own quest for answers to the questions her children posed as they sought to make sense of their feelings and the world around them. “Where did I come from? Will you get sick and die? Why do I have to share? Do trees have feelings? Why doesn’t anyone want to play with me? What’s a bomb?” Whether she is fielding simple queries like “Why do I have to say thank you?” or deeper ones that require much soul searching about her own beliefs, Mallika Chopra draws on history and myth, global wisdom, and rich personal anecdotes to craft responses that expand children’s sense of wonder. This beautifully designed book, with inspirational reflections and stories accompanying the 100 questions, makes an irresistible gift for any mother of young children or any person asking questions about our place and purpose in the universe.